Never be without the tides again! You too can carry the tides in your pocket as you walk along the shore, fly into a harbor, or sail off into the sunset. 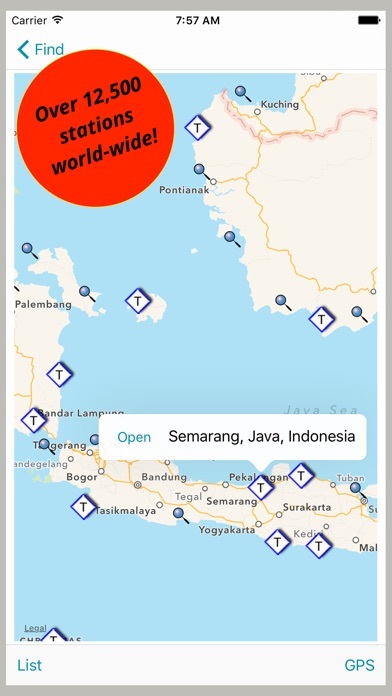 AyeTides displays tides and/or currents for over 12,500 locations worldwide and unlike many other tide apps, it does not require a network connection. With AyeTides you will never see those annoying ads or be asked to pay for additional features! Sailors, harbor pilots, beachcombers, nature photographers, and more use AyeTides to plan their outings on or around the world's oceans. Here are some of the things people are saying about AyeTides... "AyeTides is a quality professional product” "Your support has been the best I have experienced!" “As a harbor pilot in New York I’ve been using your excellent tide and current app” "I really appreciate the effort that you put into making AyeTides as accurate as it can be. It is a great program that has been very useful to us. I think we have 60 pilots using iPhones and iNavX and your app links in so well." 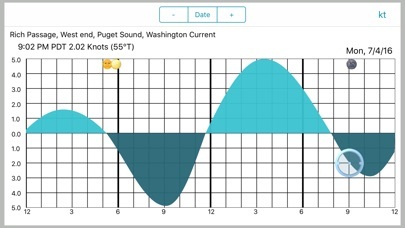 "I am a ships Pilot in BC and use Aye Tides a lot and it has become invaluable.” You can see the day’s events in tabular form, or you can rotate the phone for an interactive graph that shows you the tide’s value at any point during the day. You can find a station on a map, by name, or based on your current location. AyeTides is updated regularly and stations are added whenever we find new data. We encourage our customers to contact us if you hare having any issues with the program so that we can help you. This app is designed to run on your iPhone or iPod Touch. While it will run on your iPad, it does not offer the additional features available with AyeTides XL, which was designed specifically for the iPad. If you have multiple devices, you may want to consider our bundle. You get both apps at a discount! 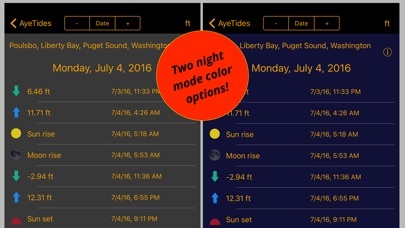 AyeTides has long been a good tides reference tool. Have been using it for several years. The publisher has diligently evolved it, adding a number of useful shortcuts and display features, most notably month view, while still keeping it simple. Top notch. A useful tool for sailors. I strongly recommend it. 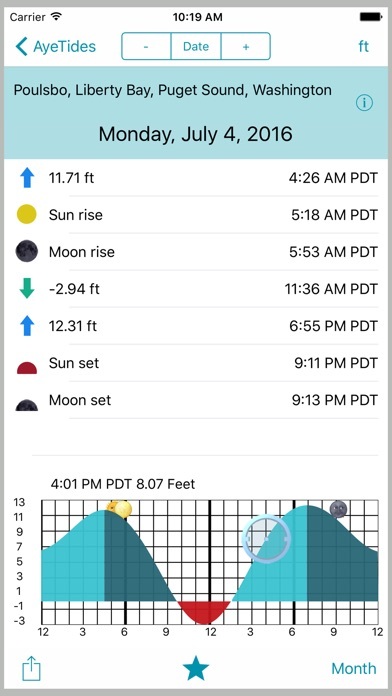 As a sailor, as a dog owner (who loves the beach), and as an owner of a remote beach cabin in Alaska, I could not imagine living my life without this app. I also check regularly it for lunar phases and sunrise/sunset times as I travel around to different parts of the country. There are so many uses, but if you live near/participate in water activities I can’t recommend this app enough. I don’t leave home without it! If you don’t know what to expect. This app wised me up! Thank you! Use AyeTides regularly and I find it to be indispensable How about a Watch version? 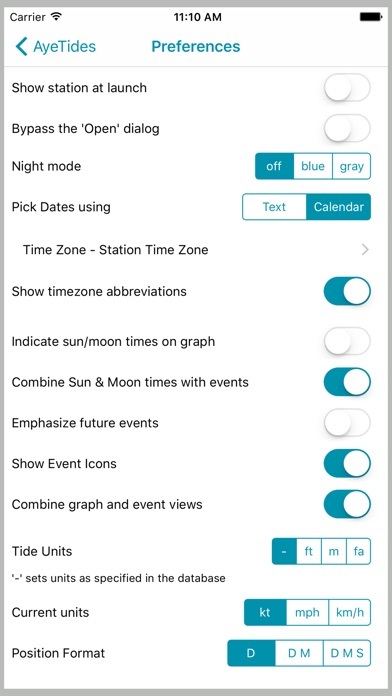 The Watch tide apps are just not up to AyeTide standards. I rely on this App daily for my Montauk fishing charter boat business. Very accurate, crucial to my fishing successes. There should be an option to show the tide cycle as a graphic! Fantastic database updates and bug fixes. Immediate response to my minor display complaints and fast insertion to version upgrade. Works great world wide. Much more useful and more accurate than major chartplotter software.